On September 24, National Public Lands Day, I hope you had the chance to get out and enjoy one of our beautiful U.S. national parks or monuments. I spent all that Saturday at the book fair of the 2016 Montana Book Festival in the heart of Missoula. 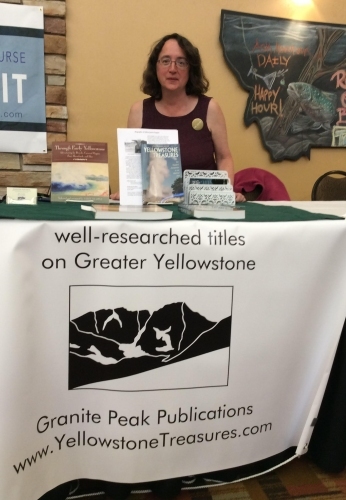 Thanks to festival director Rachel Mindell and her band of hard-working volunteers, people had the chance to hear author talks and peruse new books with Montana-based authors or themes. While the book fair was free and open to the public, many participants bought a festival button so they could attend the various events. Some people stopped by the table to reminisce about Yellowstone Park, take a free Yellowstone Treasures postcard or Through Early Yellowstone bookmark, or buy a book. I’ll be taking the show on the road again for Wordstock in Portland, Oregon on November 5th–maybe I’ll see you there! 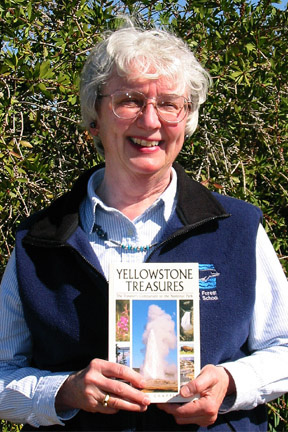 Exactly twenty years after gray wolves were reintroduced to Yellowstone Park, Kathie Lynch has given us a wonderful summary of their present very healthy state in the park. This is spite of the unfortunate killing of several collared wolves, at least three of them alphas, in the three hunting seasons since they were removed from the Endangered Species list in Montana, Idaho, and (until September 2014) in Wyoming. 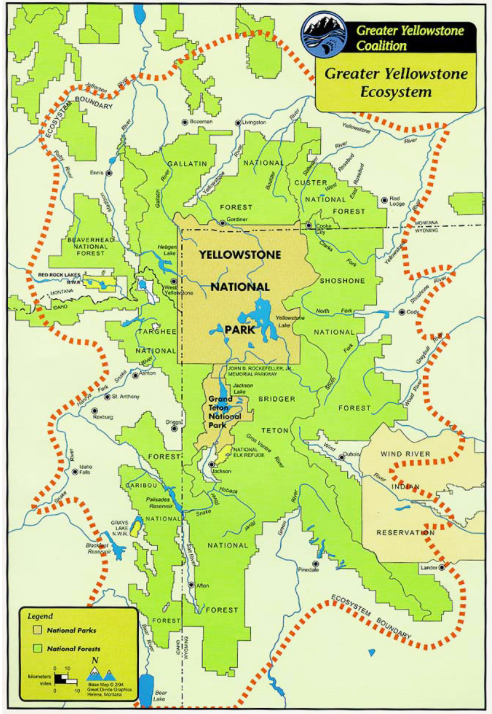 All Yellowstone Park roads except the all-weather road between Gardiner and Cooke City in the northern part of the park will close Monday, November 3, 2014, at 8:00 am. And just in time, too: On Sunday and Monday, October 26 and 27, there was up to one foot of snow in some places and a few drivers were stranded until snowplows could reach them. A dusting of snow remained at Old Faithful in late afternoon on Tuesday (10/28), as I just saw on the Old Faithful streaming webcam. December 15th will be the day most roads will be ready for snowcoaches and snowmobiles. Who Are Yellowstone Country Guardians? Comments Off on Who Are Yellowstone Country Guardians? At a beautifully illustrated lecture about grizzly bears in Yellowstone Park, I was recently [April, 2012] introduced to a remarkable young organization, one whose main mission is to inspire the youth on the fringes of the Yellowstone Ecosystem to become aware of the wonders so near them and of what they can do to help preserve them—to become guardians of the Yellowstone country. As future guardians, high school students from Bozeman, Emigrant, Gardiner, and Livingston, Montana, take the Yellowstone Leadership Challenge. They climb a mountain, watch Lamar Valley wildlife on an early morning, participate in a service project in the park, and learn about conservation issues. Formed in 2009 and led by the enthusiastic and dedicated former ranger, Michael Leach, this group hopes to bridge a perceived gap between many of the hitherto unconcerned citizens living in and near Yellowstone gateway communities and the park’s delights and needs. So far, the Guardians’ program has created a fly fishing school and a bear education program for high school students. It has begun to interview and film Yellowstone Country residents telling their stories about living in this unique environment. Its Regional Road Tour aims to foster greater understanding of the area’s wildlands and encourage community participation in their stewardship. I wish them well. 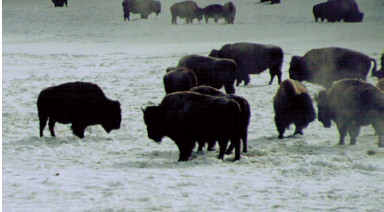 For more information or to learn how you can help the organization, see: www.yellowstonecountryguardians.org. The top of the food chain is always the most controversial. Last week [August 2010], U.S. District Judge Donald Molloy in Montana overturned last fall’s decision by the Interior Department to remove the gray wolf’s Endangered Species protective listing. The previous decision had resulted in the states of Montana and Idaho holding wolf hunts that saw the deaths of several hundred wolves, while wolves in Wyoming (outside of the national parks) were still protected, since Wyoming’s delisting plan had been deemed unacceptable. Meanwhile, grizzly bears were returned to the Endangered Species Act list, also last fall, due to another ruling negating their delisting due to the adverse effects of global warming on the bears’ ability to find food. 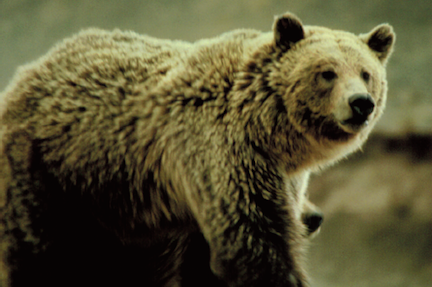 The terrible death and maulings by a grizzly sow in a campground near Cooke City, Montana this month might have been related to the sow being malnourished, but the direct cause was probably her associating people with easily obtained food. A photographer had been baiting the bear shortly before that tragedy occurred. The marauding bear is now dead and her three cubs placed in the Billings zoo. The Spokane, Washington Spokesman-Review published the following figures on March 21, 2010, gleaned from the U.S. Fish and Wildlife Service: In addition to at least two packs each in the states of Washington and Idaho, they have counted a minimum population of 843 wolves in Idaho, 524 in Montana, and 320 in Wyoming. The USFWS figure for Wyoming includes the Yellowstone wolves, which biologist Doug Smith reports has declined from 171 in 2008 to 56 this year. The current scourge of mange in Yellowstone wolves accounts for much of this decline, with distemper in pups and predation by other wolves contributing.